SECUREDATA hardware encrypted devices have been named a CES 2019 Innovation Awards Honoree for the computer accessories category and cyber security and personal privacy category. These devices are the new standard in securing all of your data while on the go. 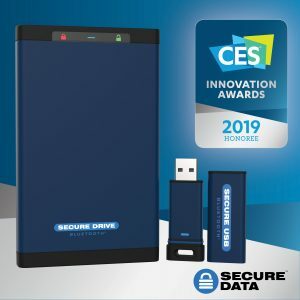 Los Angeles, CA – Today, SECUREDATA announced that two of its products have been named CES® 2019 Innovation Awards Honorees, the SecureDrive® BT Managed and SecureUSB® BT Managed, both highly secure hardware-encrypted portable data storage devices with secure wireless user-authentication and remote management ready. SecureDrive® BT and SecureUSB® BT products are manufactured by SECUREDATA and are using patented DataLock®BT technology licensed from ClevX. The announcement was made during CES Unveiled New York on November 8, 2018, an invite-only tech event bringing together top media, exhibitors, and industry leaders for a sneak peek of the products and trends expected at CES 2019, which will run January 8-11, 2019, in Las Vegas, NV. SecureDrive® BT and SecureUSB® BT are the world’s first and only hardware encrypted portable data storage devices that are user-authenticated via a mobile device (Android/Apple) using DataLock® mobile apps. The devices are remote management ready with unlock, remote wipe, geo-fencing, and time fencing. Both products are Host/OS-independent and work with and across all devices supporting USB ports. They are part of the SecureDrive product line that was developed and introduced earlier this year to meet the growing security needs of government and the private sector in such areas as financial services, military, law enforcement, legal, healthcare, and education. Everywhere where data protection is a must. The DataLock® apps (User, Admin, Managed) allow the user to authenticate via TouchID or FaceID, making the user experience streamlined and modern. The DataLock® BT Web Console is a Remote Management subscription web-based service that allows the company IT manager/administrator to control who can access the data, where it can be accessed, and when it can be accessed. It also can be used to remotely unlock the device, change the password, wipe the data, or disable access even if the user has set a password. “We’re thrilled and honored to have our DataLock BT Secured portable data storage products recognized by the Consumer Technology Association for its innovation, quality, and design.” said Michael Vanoverbeke, Product Management Director of SECUREDATA. “It’s also a huge point of validation for all the incredible work we’ve seen from both SECUREDATA and ClevX teams throughout the development process. We’re excited to be recognized as leaders in the cyber security industry. This award truly shows our ongoing commitment to produce highly secure, easy to use, and cost effective data storage products for both personal and business use”. CES Innovation Award entries are judged in 28 product categories by a panel of designers, engineers, and members of the tech media. The reviews are based on design, functionality, consumer appeal, engineering, and how the products compare with competition. SecureDrive® BT and SecureUSB® BT will be on display in the Innovation Awards Showcase at the upcoming CES 2019. The complete list of CES 2019 Innovation Honorees, including product descriptions and photos, can be found at CES.tech/Innovation. SECUREDATA, Inc. is a privately held company, headquartered in California, USA. SecureData offers a range of tailored high-level data protection capabilities through a set of services and products. These include hardware encrypted portable storage devices, backup solutions, file repair software, data recovery, and digital forensics services to help clients achieve their security objectives. SecureData has a presence through its partners in North America, Europe, Middle East and Africa (EMEA), Asia, and South America, and serves companies and organizations in regulated industries, such as government, financial services, military, law enforcement, legal, healthcare, and education. More information regarding the SECUREDATA products line can be found at securedrive.com. ClevX is an IP/Technology development and licensing company — Your Innovation Partner. It is focused on the Security/Mobility markets where ClevX pioneered its award-winning DATALOCK® KP/BT Secured USB drives (OS-agnostic, hardware encrypted, PIN- or Phone-activated, bootable) and easy to use portable software applications (ClevX Apps) for secure drives for personal and business use. ClevX differentiates itself by creating solutions that are simple, clever, and elegant.